Hoover Dam Bypass is OPEN! 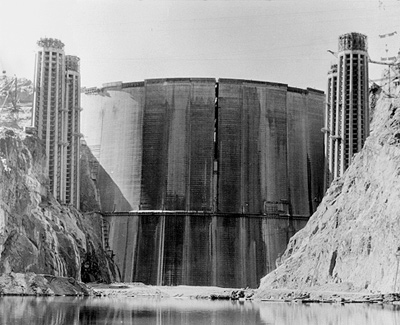 These pictures to the right were take in 1935 when one of the largest hydroelectric projects in US history was close to completion, Hoover Dam. The project was started in 1932 during the Hoover era and finished May 29, 1935 during the Roosevelt era. 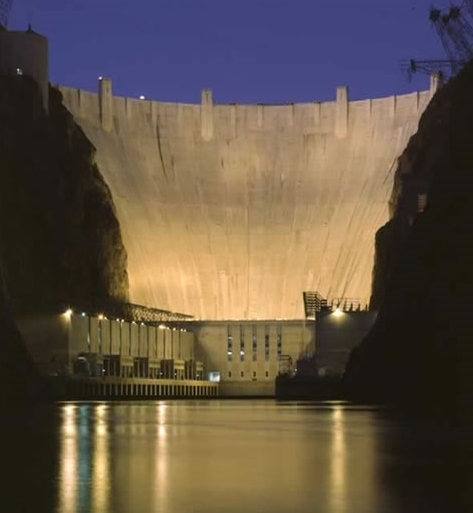 The dam planning stage started in 1920's to tame the mighty Colorado river. This project was primarily needed to alleviate the constant flooding of the Imperial Valley, regularly breaking manmade dikes and levies and ruining farmlands for years. In 1905 the river overflowed so much that it flowed over 50 miles to create the Salton Sea, filling what was once an ancient dry lakebed. Unfortunately man had been mining salt from this dry lakebed for years to provide salt to the LA area. The flooding of the salt mine eliminated LA's source for salt, and as a result this new body of fresh water turned salty, today 5 times as salty as the ocean! Hence, the need to tame the Colorado river was of high importance to prevent future disasters. 15yrs later Hoover Dam was conceived. 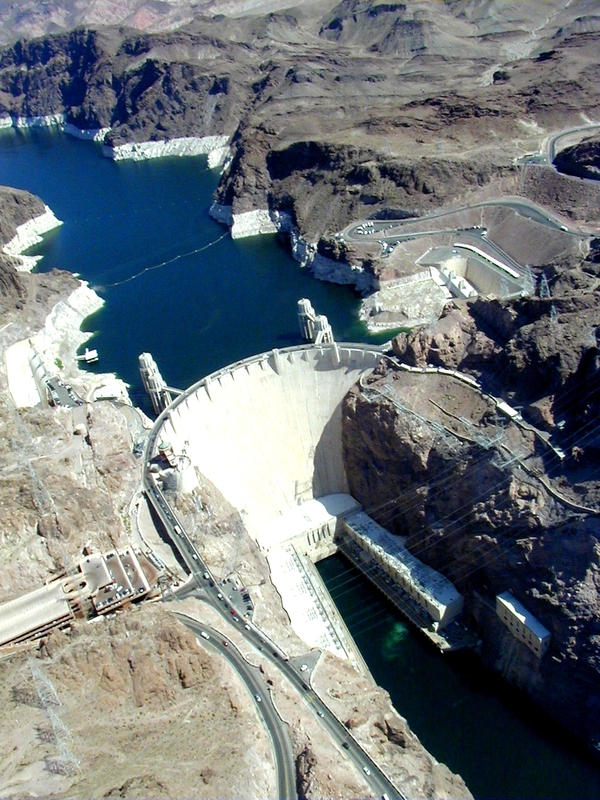 The site of Hoover Dam was very key for the project to hold one of the largest manmade bodies of water in the country. Near Boulder Canyon, the dam was originally called Boulder Canyon Dam. 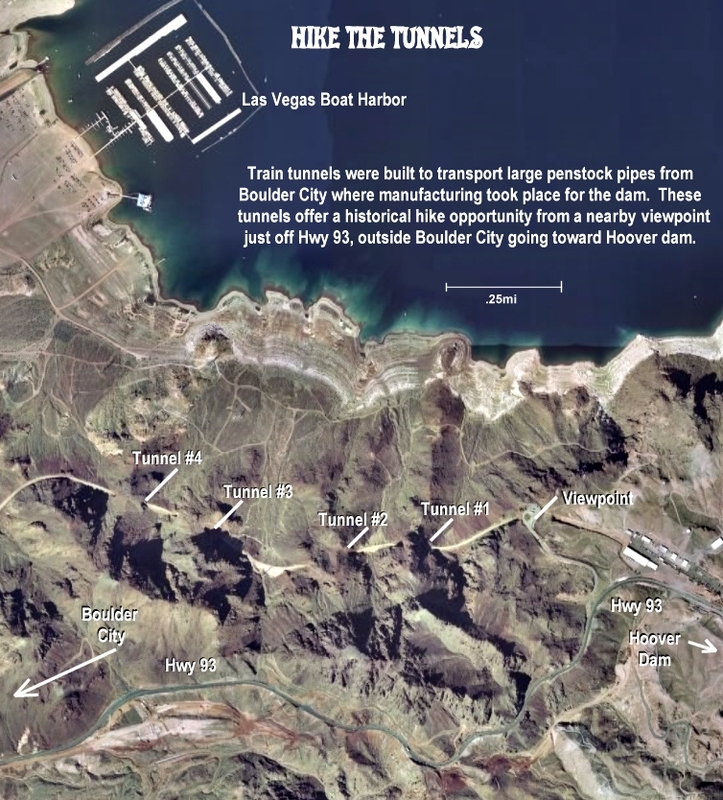 The nearby down of Boulder City was created specifically to house and feed the workers that built the dam, not to mention manufacture many of the parts for the dam, like penstock pipes. Even by today's standards Hoover Dam was a gigantic project. At the time it was the worlds largest project made with concrete, not to mention the largest public works project in US history. Keep in mind there were no computers, this was all done on paper using a slide rule and pure ingenuity. It's an amazing engineering accomplishment. After years of planning the project began in the middle of the Great Depression. Workers were easy to find, pay was good for those times but the work was dangerous and very hot during the summer. Work occurred 24X7 to finish the project as soon a feasibly possible, and it was finished 2yrs ahead of schedule. The first job was to divert the river which began in 1932. This was done by building two cofferdams to prevent flooding and divert water around the construction project using diversion tunnels. At the same time the diversion project was underway, the canyon walls were prepared to hold the new dam by clearing loose rocks with dynamite and bulldozers. Remnants from the canyon clearing aided the building of the cofferdams. Over the a total of 5yrs of construction (April 1931to March 1936) there was an average crew of 3500 men that worked on the project daily. Over this 5yr period there were over 21,000 individuals that worked on the dam. Monthly payroll during the 5 years for an average crew of 3500 was $500,000, or $140/mo per worker. Pouring thick concrete has it's own problems. The curing process of concrete creates heat. Thick bodies of concrete cannot cure evenly, required for strength and integrity to prevent cracks. Another problem is the concrete needs to cure fast enough to stay on schedule. To address these problems the concrete was poured in 5ft thick sections with embedded cooling pipes that run water through the concrete to cool the concrete evenly and quickly. These 1" pipes are still in the dam concrete today, over 582 miles of pipe! But even today the concrete is still curing, harder and harder every year......... 75yrs later. The dam is a whooping 725ft high, 2nd highest in the country. 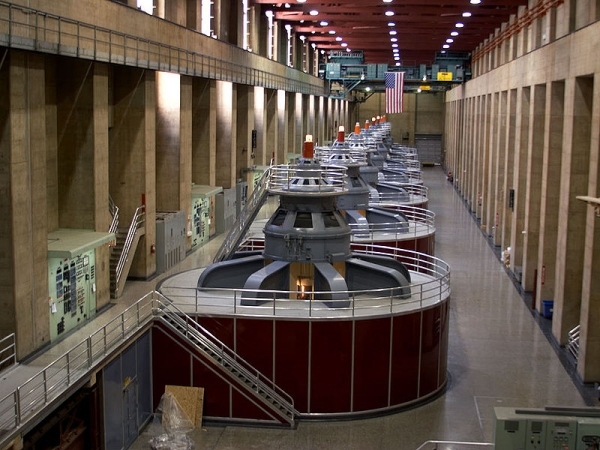 The dam generators produce over 2000 megawatts of power from water turning might generator turbines. Besides the massive watershed and electrical power the dam generates, it also provides an incredible playground for boaters and fisherman. 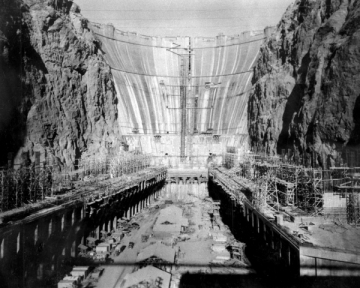 Lake Mead was named after the dam's project manager, Elwood Mead who was a legend in his own time with such an incredible engineering project, successfully done without computers! With the rugged working conditions, dangerous and hot, there were 112 lives lost from various reasons, such as accidents, heat stroke and heart failure. In the very beginning when work started there was a strike attempt which failed, but resulted in more attention to providing water hydration to workers on a regular basis.... well duh! Originally deemed the Boulder Canyon Dam, in 1931 it was named Hoover Dam by Ray Wilbur, President Hoovers interior secretary. This was very controversial as Hoover was commonly blamed for starting the Great Depression. Later when Franklin Roosevelt became president in 1932 (before the dam was finished) it was renamed "Boulder Dam" by Harold Ickes, FDR's interior secretary who disliked Hoover and his economic policies. In 1947 the dam was renamed "Hoover Dam" by President Truman under pressure from Congress as the public forgot about President's Hoover's handling of the Great Depression. Hoover dam also served as a highway connector between Arizona and Nevada. A two lane highway on top of the dam used to handle ~ 17,000 vehicles crossing the dam each day. As a result of 911 no heavy trucks are allowed to cross the dam. 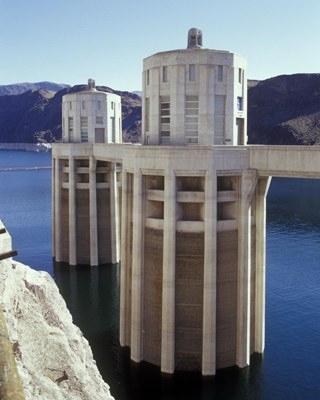 If you're visiting the area MAKE SURE you take the HOOVER DAM TOUR. It's the best dam tour in the West ;-) You'll talk about the tour for years, seeing massive generators, pipes, and concrete objects, including a big bridge, all made by man. It's truly and incredible dam that inspires people of all ages, sexes, religions and races. It's a must do tour. 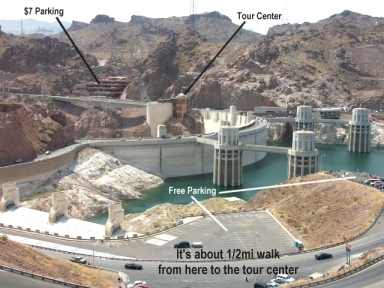 The economical visit includes FREE PARKING on the Arizona side of the dam. Have your most fit person volunteer to drive and drop others off at the tour center to wait in line for tour tickets. Your volunteer walks the 1/2mi from the free parking lots to the tour center, about an 8min walk. Stay in touch with your cellphone. This little tip will save you time and money. If you haven't taken the dam tour before, it's a good prelude to visit the Alan Bible visitor center before you do so, it's free. They have all kinds of information about Lake Mead and the surrounding areas to help you get oriented with your visitation plans. The visitor center is open from 8:30am to 4:30pm except Thanksgiving, when it's closed.